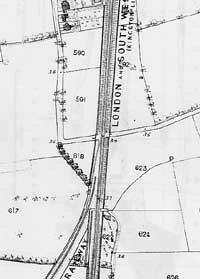 The great transport revolution brought the railway to Twickenham in 1848. 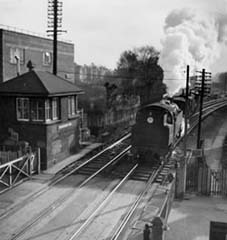 Fifteen years later a loop line was built to Kingston with a level crossing at Strawberry Hill. Railways were not popular in their early days. People were worried about safety on level crossings. There were complaints about the noise of the trains and "the horrid clangour" of the station bell announcing the arrival of a train. Why was the station built? 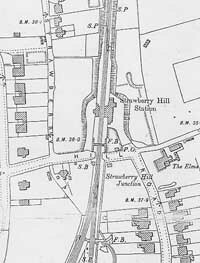 Strawberry Hill station was opened on 1 December 1873. It has been sugested that Lady Frances Waldegrave of Strawberry Hill House wanted the station built for two reasons. To provide a station close by for her visitors and to raise the value of houses nearby. Train fares have changed a great deal since these early days. In 1893, the cheap day return fare to London was 1/6d (7 1/2 pence). It was possible to transport your horse and carriage in a separate compartment. One shilling (5p) would buy a hot water bottle for the journey.